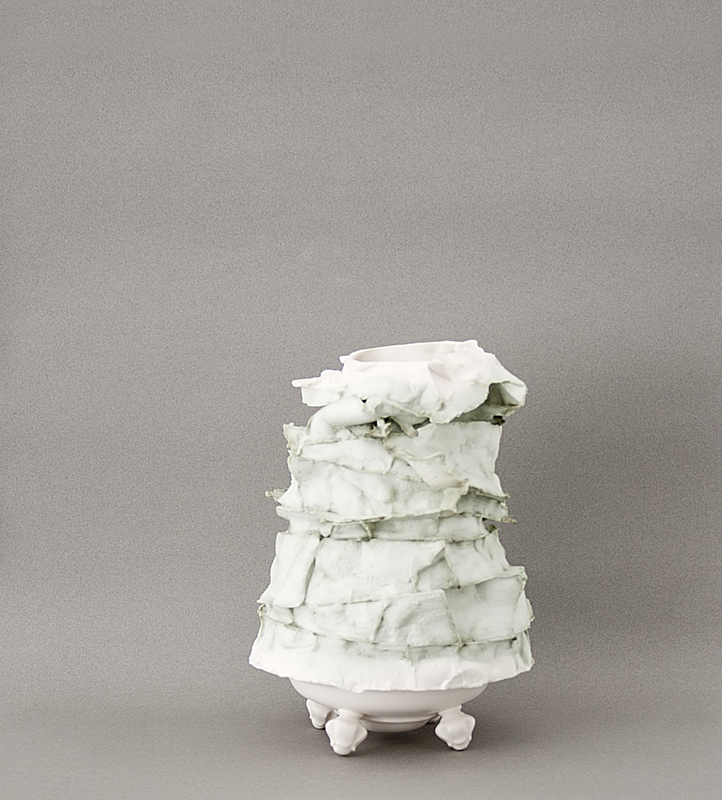 Polish ceramicist Monika Patuszynska was introduced to ceramics in Denmark over 20 years ago. Since then, she has never felt the necessity to use any other medium as an artist. “Ceramics, especially porcelain, offers everything that I need; it can be both abstract yet able to convey representational ideas. It is tactile, intimate, and constantly challenging.” Material that, for some, epitomizes banality and crass commercial kitsch is elevated to high art in her studio. Casting is Patuszynska’s primary artistic technique. Traditionally an industrial method to produce identical commercial products, in her hands it becomes a means of producing enormously rich and almost impossibly unique pieces. What inspires her most about the process is its potential for errors and accidents. “The objects themselves are not the main focus; they are a side effect of my explorations. Indeed, the most profound ideas are those that cut the deepest. 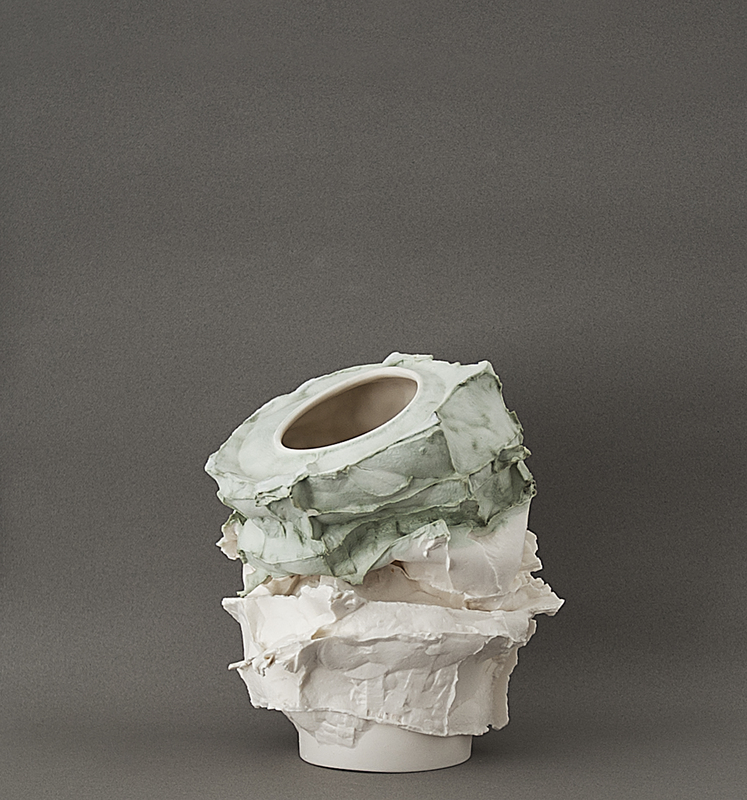 The work in this show come from broken—crippled if you like—plaster molds collected from abandoned ceramic factories. They are borrowed details and processed designs of others, which are then shattered, mixed, and assembled under the hand and will of the artist. The pieces on show are hybrids, cross-breeds—even genetically modified if you are no technophobe—produced from the DNA fragments of found plaster molds, now modified and conjoined to form a completely new species. Even in the breaking of the mold, the process is never merely random. Patuszynska is an accident tamer. She plays with the nature of accidents and works with them. An accident is usually considered an error. However the tamed accident is not an accident any more, is it? The tamed accident becomes a technique. “I am not really interested in conquering nature, in overpowering the material. I find nothing thrilling in that. What interests me most is learning more about the true nature, the essential potential of the material. I want to understand it and to treat it as a partner by embracing the imperfections of the process. The limits of proper casting technique has always seemed too narrow for her. The list of do nots becomes for her a list of must do, something to be explored. As Bernoulli said of Newton “Tanquam ex ungue leonem” (We know the lion by his claw). The same can be said of Monika Patuszynka. Patuszynska has this year become artistic director for Institute of Design in Kielce, Poland. Monika Patuszynska (Personal show 2011).